The word “education” comes from the Latin verb “educere” which means “to lead out.” For children in many parts of the world, an education is a way to lead their families from poverty to prosperity. In Thailand, education for girls means earning a higher degree or learning a respected trade. Without an education, girls growing up in poverty often end up being trafficked into prostitution and living on the street. At the Dhammajarini Witthaya School, the only free boarding school for at-risk girls in Thailand, girls are not only being given a safe haven and a quality education, but have the opportunity to develop their mental, emotional and physical potential by practicing the Transcendental Meditation technique. They are literally being “led out” to a better life. While visiting Thailand recently, I had the pleasure to interview two students at the Dhammajarinnee Witthaya School, where 500 children preschool to age 12 meditate together. The school is located on 11 acres of gardens, lakes and shady lanes. Outside the beautiful administration building, smiling girls in crisp uniforms stop to greet me, saying in perfect English, “How are you?” I talk to them for a moment. English and Chinese are part of the curriculum here, which includes computer science and other college-prep courses, as well as instruction in traditional Thai crafts. Aytittaya, age 16, tells me, through a Thai interpreter, that she is in grade 10. She is wearing a blue polo shirt and sweat pants, the attire for after-school chores and sports. While we talk inside Acharn Yai’s comfortable office, we can hear the happy sounds of children playing outdoors. Then in grade six, her great grandmother, who is a Buddhist nun, found out about the Dhammarjarinee Witthaya school and her mother brought her here. Aytittya smiles again when she describes how naughty she used to behave. “At my other school, I didn’t listen to my mother and listened to my friends instead,” she says. “I’ve changed a lot.” She is more focused on her studies, and she’s proud that she just won the province-wide competition for Buddhist chanting. And her team just won second place for the national Mind Map competition. Apinya, also sixteen years old in grade 10, has a different story. She comes from a very poor family in Ratchaburi province. When she was only eight, her parents divorced and her mother left her with her father and two older sisters. Her father had a difficult time making a living, and took his anger out on Apinya. Eventually, her teachers removed her from her abusive home environment and placed her first in a foster home, and then brought her to the Dhammajarinee School. Apinya also was on the secondary school team that won second prize in the national Mind Map contest, and later this month she will compete in the national Memory Competition. I ask the girls if they mind doing chores for the school. Aytittya says that her job is to help clean the buildings, take care of the grounds and cut the grass. Aditya enjoys learning Chinese and English as part of her studies. She would like to go to college and study Chinese and become an interpreter, while Aytittya wants to become an air hostess so she can travel to see her mother, who now works in Norway. Or, they both mention, after college they may come back to teach here, at the Dhammajarinee Witthaya school, to give back to others the same extraordinary education that they have received. Photos by Tina McQuiston, reprinted with permission. I was deeply moved while writing two previous blog posts about the Dhammajarinee Witthaya School, which provides 500 at-risk girls in Thailand a free education. So when I took a short trip to Bangkok last month, at the top of my wish list was a side trip to Ratchaburi Province to tour the school and meet Acharn Yai, the extraordinary Buddhist nun who is the headmaster of the school. At the Dhammajarinee Witthaya School, 400 students practice the Transcendental Meditation technique together each day. For Acharn Yai (translated as “headmaster teacher”), TM is not only a way to help girls with a history of extreme poverty, broken homes and domestic violence to find their way to a successful and happy life, but it’s a way to create peace for the entire country. Visiting the school in person was much more impressive than writing about it from a distance. The buildings and grounds were light-filled, clean, spacious. We were greeted by several teachers with a traditional Thai greeting of “Swasdeeka” and trays of Thai sweets artfully wrapped in banana leaves. After refreshments, we were invited into an air-conditioned office where Acharn Yai took time from her busy day to answer questions. I was deeply moved by Acharn Yai’s warmth, her beautiful heart and her love and compassion for the girls at the school. Linda Egenes: How has the TM technique helped girls to learn? Acharn Yai: What has helped these girls the most is growing in consciousness. Normally people focus on physical development, development of the body, and they forget consciousness, the inner life. In order to grow in wholeness, a full life, the students need to develop both the consciousness and the body together. For growth of consciousness, they learn the TM technique. Linda Egenes: What do you do to help the children grow strong physically? Acharn Yai: For the body, we give them proper food of all five food groups, with plenty of vitamins, minerals, proteins and healthy fats. We also make sure they have time to exercise every day. We provide a safe, secure and beautiful environment for them to live in. Every morning the nuns who live here go out to the village to beg for food. This is not the traditional way for nuns in Thailand to find food to eat, but we need extra food to feed the growing girls. Yet there is not enough food from begging to feed all the girls! So we have a kitchen and a cook to prepare meals for the students. We buy some food, such as chicken and fish, and the girls grow organic vegetables and mushrooms and harvest the fruits from the banana and coconut trees. Other girls help cook, and others keep the lawn mowed and the grounds and buildings tidy. Each girl has a job in addition to their academic studies. Linda Egenes: How have the children changed since they started meditating at the school in 2009? Acharn Yai: Most of the girls have come from a rough or problematic background. Their families were unable to care for them properly, due to divorce, extreme poverty, domestic violence, or neglect. So these children are so delicate in heart and mind. After they begin the practice of meditation, their minds become stronger. When they are more strong and stable inside, whatever they do will be more successful. TM is just like a medicine to cure and nourish and uplift them and help them become better students and people. Linda Egenes: Have the students grown in academic achievement since you introduced the TM technique to the school? Acharn Yai: In the first years of the school, before we introduced Transcendental Meditation, the teachers never took the girls to competitions with other schools because they were not ready. Some girls were so tough they would make the teachers cry, made their friends cry. We had to replace the teachers every month because they did not want to stay. Now, since adding TM to the curriculum in 2009, the girls not only attend all government competitions, but they win prizes. Last week some of the girls attended a Mind Map Competition—a national competition for creative thinking and drawing skills. One of our students won first prize for the primary level (Grades 4, 5 and 6) for the entire nation. They were asked to draw “My Happiness.” She drew the parts of her day that made her happy—such as taking a shower and eating sweets. The judges felt that she expressed her inner feelings, and that’s why she won the first prize. For the secondary school level (Grades 7, 8, 9), a team of our students won the second prize for Mind Map Competition and also second prize for the Memory Competition. In fact, out of all the public government-run schools in this province, our school is now considered the top school for academics of all kinds. This has only been possible since we started teaching the girls the Transcendental Meditation technique and the advanced TM-Sidhi program. Linda Egenes: I know that you were adding on grades as the children grew up, and now for two years you have offered all 12 grades. How many of your graduates are going on to higher education? Acharn Yai: Out of the 25 who finished grade 12 last year, 22 continued on to college and three went back to their villages to work. A donor has contributed to a special fund so the students can receive scholarships if they wish to go to college. Linda Egenes: How does TM help the intellectual development of students? Acharn Yai: Transcendental Meditation helps the children become more calm, more peaceful, more intelligent, and more focused on their studies. As Maharishi said, there is so much knowledge to learn, it is infinite. What students need is to develop their consciousness by practicing TM. Then they expand their minds, the container of knowledge, and expand their capacity to learn more and more. Linda Egenes: And moral development—does that also grow? Acharn Yai: When the students practice TM, their consciousness become more pure, more good. Naturally their behavior, whatever they do, is good. That’s the direct consequence of meditating. Because of their backgrounds, most of the girls, when they first come, are angry and sad. This gets expressed in rough behavior. They may fight the other girls or act aggressive. After they start meditating, they become more soft, more kind. After they meditate they become happy and find life is more fun. Linda Egenes: How does the TM technique fit in with Buddhist education? Acharn Yai: By practicing TM, it makes us understand the Buddhist religion more deeply. Between TM and Buddhism there is no conflict. Lord Buddha taught us to do good, to not do non-good, and to make our hearts and minds pure. Doing TM, your consciousness becomes more pure so it’s very much in accord with what Lord Buddha taught so there’s no conflict at all. And when the students meditate more and more, they are more and more peaceful so they can understand the teaching of Lord Buddha better. It’s easier for them to be good. When you meditate you contact pure consciousness, then naturally your thinking, your action and speech are good and you don’t do any harm to anyone. You don’t have to force yourself. When you have good consciousness it would hard for you to do anything that is not good. When you have a pure heart then non-good will not happen. Linda Egenes: What do you see as the future for your school and what is it that you need to reach that future? Acharn Yai: I would like to have 1000 students meditating together and doing the advanced meditation program of the TM-Sidhis together. That will create peace and happiness not only for these students, but for all of Thailand. That’s why we are building a bigger dormitory, so we can enroll more students. Linda Egenes: Why do you feel that education is important for every mother, every woman in Thailand and the world? Acharn Yai: Education is the root of life. Through education you can have the knowledge to support yourself and your family in this world, to earn a living. But even more, real education provides the proper knowledge to live a full life. It helps you to develop your inner consciousness so you can bring peace and happiness to yourself and everyone around you. Linda Egenes: How do you feel that the TM technique can help women around the globe, to realize their full potential? Acharn Yai: If we practice Transcendental Meditation we will have inner happiness. We will have more strength. We will be more calm and peaceful. When we are more peaceful we have clear vision. Then if a problem arises in life, we can see clearly what is the cause and how to solve the problem properly. If you don’t meditate, when a problem arises, you tend to keep repeating the problem, and you can’t solve the problem as easily. Some people will run away from a problem and continue to run. But if you don’t solve the problem it will just keep following you! That’s why it’s important to have a peaceful mind so you can see the source of the problem and solve it properly. Acharn Yai is not a typical Buddhist nun. For one thing, she drives a car, uses a cell phone, and is committed to employing the best of modern technology to help the school thrive, even creating her own videos for fundraising. She is also the founder of a unique school in Thailand. In 2003, Acharn Yai founded Dhammajarinee Witthaya School, the first and only free Buddhist boarding school for Thai girls who are at risk due to poverty, abandonment, or abuse. The school now has 530 in-residence students from preschool through grade 12, taught by 41 teachers. In order to accommodate 500 more girls who wish to attend the school, a new classroom building is already under construction. The story of one woman uplifting thousands of girls from poverty is inspiring, to say the least. These girls not only receive safe haven and a free education—they are being transformed in ways that no one could have predicted or imagined. Under Acharn Yai’s leadership, they practice the Transcendental Meditatio technique twice a day, which she credits as the turning point for the school—since the girls started meditation, they now win top academic awards, live in harmony together and have learned skills to succeed in a culture that would otherwise exploit them. It would be hard to imagine anyone as suited to the job of leading the school as Acharn Yai. As she walks through the peaceful campus, the sounds of Buddhist chanting mingle with birdsong. The younger girls flock around her as she walks. It’s obvious that she is not only revered by them, but dearly loved. Outsiders also have recognized Acharn Yai’s gifts. In 2012 she received the Enlightened Leadership award from the Global Mother Divine Organization in Vlodrop, Holland. And for her service in providing a free education to thousands of girls in poverty, she was honored with a service award for her leadership in Ratchaburi province, where the school is located. It was Acharn Yai who made the decision to introduce the TM technique to the school’s staff and students in May 2008, having heard about the educational benefits. Yet she herself preferred to remain a cautious observer and even went into hiding while the TM instruction was taking place so she would not get pulled into learning! She became curious about why this simple and easy technique could make such a dramatic change in her school. To find the answer firsthand, she finally decided to learn Transcendental Meditation in December 2008. Acharn Yai also feels that the practice of Transcendental Meditation supports traditional Buddhist values. Based on her own experience, Acharn Yai became the first Buddhist nun to become a teacher of the Transcendental Meditation technique. 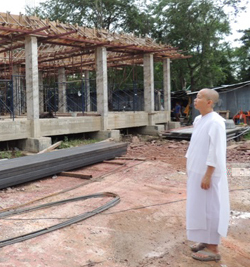 The construction of a large building is now underway to accommodate the 500 additional girls. A significant portion of money has come from the government and private donors, but the school still needs to quickly raise $95,000 to finish this large building in 2014. This dynamic woman is thinking beyond the individual lives of these students, to ways they can become a force for good for the entire country. If she realizes her goal of providing room for 1000 students, then more than 800 students and teachers will be practicing the TM program together. Noting research on the positive changes that take place for the community and nation when large groups of people practice the Transcendental Meditation program together, Acharn Yai aims to create nothing less than national coherence for Thailand. And that will be the greatest transformation of all. Thailand is a mystical land of Buddhist temples and an ancient culture steeped in spirituality. Yet when the modern world collides with traditional cultures extreme poverty, dissolution of families, and exploitation of children—especially girls—can result. Unlike Thai boys, who can receive a free education in Buddhist monasteries, disadvantaged Thai girls have far fewer opportunities to raise themselves out of poverty. In many cases their only chance for survival is to live on the streets or work in factories at a young age, leaving them prey to drug addiction and prostitution. They did not recognize the power of one woman on a mission. In 2003, Acharn Yai founded Dhammajarinee Witthaya School, the first and only free Buddhist boarding school for Thai girls. The school now has 530 in-residence students from preschool through grade 12, taught by 41 teachers. In order to accommodate 500 more girls who wish to attend the school, a new classroom building is already under construction. The story of one woman uplifting thousands of girls from poverty is inspiring, to say the least. These girls not only receive safe haven and a free education—they are being transformed in ways that no one could have predicted or imagined. The school recently was granted the top academic rating during the government’s yearly assessment—one of two schools in the entire province to be honored. 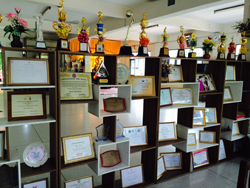 And the students consistently win top awards in every school competition imaginable, from speaking English to Thai language skills to PowerPoint presentations. In fact, this year they have won more awards than any other school in their province. At the heart of these students’ transformation from illiteracy to academic leadership, the teachers say, is the students’ daily practice of the Transcendental Meditation technique. They come from all over Thailand, speaking many different dialects. Some are orphans, some from families destroyed by divorce. Others, members of the hill tribes huddled at Thailand’s northern borders, suffer from extreme destitution. Some have been abandoned to the streets. Often their parents are young and ill-equipped for raising a child. One young mother dropped off her preschool girls because her new boyfriend didn’t want them around. One thing these children have in common: they have learned to fight to survive. Acharn Yai says that she sees this pattern over and over—the girls come in fighting, but with the TM program, the aggression goes away. The school day is full and structured, and the girls are focused from dawn to dusk. In addition to their Buddhist studies and daily practice of the TM and TM-Sidhi program, the students learn basic academic subjects, allowing them to go on to higher education. They also receive vocational training. The girls learn how to bake, grow organic vegetables, create traditional Thai handicrafts, perform basic accounting, arrange flowers, crochet, weave baskets and create Thai flower garlands. This training is critical for those not attending college, as it gives them a way to make a living when they graduate. In keeping with Buddhist principles, the students also spend time every day performing service. They keep the buildings orderly and tend the beautiful gardens. Learning how to use the Internet, make PowerPoint presentations, and create basic computer programming is an important part of the curriculum. Amine Kouilder, a student at Maharishi University of Management who filmed the remote school, said that he first glimpsed Acharn Yai’s computer acumen when she told him that he could edit his footage on her iMac using Final Cut Pro editing software that she had loaded on it. “And they had a video camera that was more recent than mine,” he remembers. It was Acharn Yai who made the decision to introduce the TM technique to the school’s staff and students in May 2008, having heard about the educational benefits. Yet she herself preferred to remain a cautious observer and even went into hiding while the TM instruction was taking place so she would not get pulled into learning. Based on her own experience, Acharn Yai not only became the first Buddhist nun to become a teacher of the Transcendental Meditation technique, but she arranged for the students to take the next step and begin the more advanced TM-Sidhi program in 2009. By the end of December 2013, there will be over 300 students and teachers practicing the TM and TM-Sidhi program together at the school. The construction of a large building, built according to the principles of Maharishi Vedic Architecture (Vastu) is now underway to accommodate the 500 additional girls. A significant portion of money has come from the government and private donors, but the school still needs to quickly raise $95,000 to finish this large building in 2014. This dynamic woman is thinking beyond the individual lives of these students, to ways they can become a force for good for the entire country. If she realizes her goal of providing room for 1,000 students, then more than 800 students and teachers will be practicing the TM and TM-Sidhi program together. Noting research on the positive changes that take place for the community and nation when large groups of people practice the TM-Sidhi program together, Acharn Yai aims to create nothing less than national coherence for Thailand. And that will be the greatest transformation of all. To make tax deductible donations to support the classroom building project and support invincibility for Thailand, please visit: http://www.seedsofheaven.org/donate/2-uncategorised/66-thai-girls-school.html. Be sure to note your contribution is for Thailand School project.